CALLS HAVE BEEN made for donations of blood, with O-negative donors being sought. The blood type, which is the universal group, is at lows of just four days’ supply, the Irish Blood Transfusion Service says. In a Facebook post today, the IBTS says that stocks were depleted by a high amount of issues over the weekend. Due to high issues of O-negative blood in emergency departments over the weekend, supply is low at only 4 days. Supply of this blood type must be replenished over the coming week.If you are an O Negative blood donor please make special effort to give blood today. Find details of upcoming clinics here. O-negative is a rare blood group that can be transfused into anybody. This means that it is the most in-demand blood type. 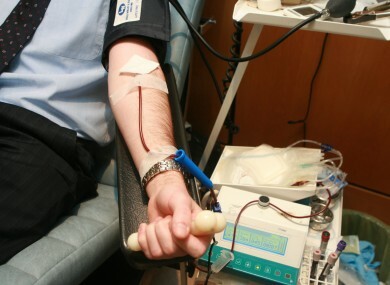 The IBTS says that it needs 3,000 blood donations every single week just to cope with demand. Email “Is your blood type O-negative? You're needed right now”. Feedback on “Is your blood type O-negative? You're needed right now”.